These are my pictures of the close approach of Spica and Mercury (Mercury is the brightest dot, click on images to enlarge them) on the Saturday (22-09-07 left hand image) and the following Sunday. I couldn't get the shots at the same time, for various reasons (hence different coloured sky and location of Spica with respect to roof)but you can see how quickly they moved apart. Taken with my digital Olympus mu:300 with 3x optical zoom. The 22nd Carnival of Space will be up in about 6 hours at Wanderings in Space. The theme this week is "Art and Imagery of Space". I'm off visiting relatives soon, so I will miss the launch. Hopefully, I will aslo miss the launch of the Dawn mission to the asteroids Ceres and Vesta as it hopefully will finally happen today. If you want to nominate posts for Carnival of Space, the instructions are here. The Great World Wide Star Count is a new citizen-science astronomy project to raise awareness about the quality of the night sky as well as encourage learning in astronomy. It runs in the first two weeks of October, October 1st to October 15, 2007. Resulst will be tabulated and published, with an interactive map of the results as well. SO keep your night time diaries clear in October, and join in this world wide event. If you haven't popped over to Ice In Space for their 3rd Birthday Quiz, do so now. It's fun and educational! 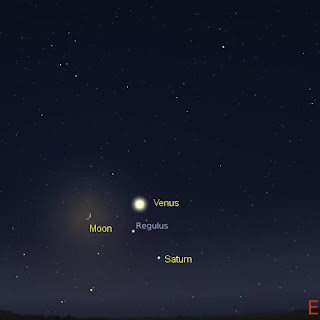 Venus, the crescent Moon, Regulus and Saturn make an intersting pattern on the morning of October 7. Octobers Southern Skywatch is now up. We have Venus and Saturn playing Hijinks, we say farewell to Mercury, say hello to the Orionid meteor shower and watch new stars rise in the sky. 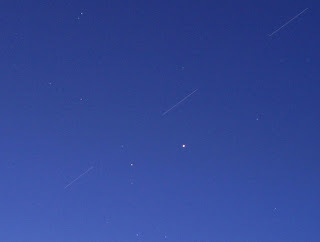 The ISS zipped past Jupiter and Antares tonight. I was able to watch it as it zoomed by. The fairly low grade video below gives a feel for what it was like. The sky was in twilight, halfway between Civil and Nautical. 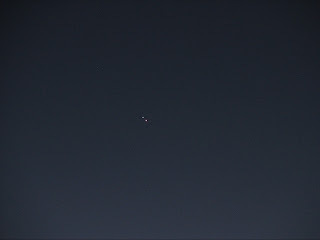 Antares and Jupiter were obvious in the darkling sky, with Mercury and Spica below. The last of the birdsong was in the air as the bright spark of the ISS climbed up from the horizon. First slowly, then more quickly. It skipped above Antares, nearly occulting Tau Scorpii, then above Jupiter (click on the image at the left to enlarge it, the image is an overlay of three separate exposures) and off across the sky. As its final encore, the ISS grazed Altair. I never tire of watching the ISS, there is a special something about knowing there are people up there, living and working on the edge of space. Having the bright ISS come close to so many bright objects is a bonus, that makes it even more special. Tonight, if you are in South Australia, you can see the ISS glide very close to Antares, and just above Jupiter at 6:48 pm. This is well after civil twilight, so Jupiter and Antares will be easily visible, and some other of the stars in Scorpio as well. 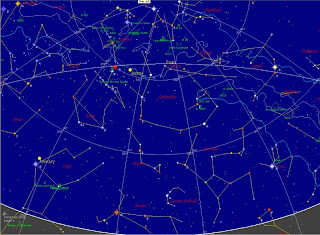 The map shows the north-west horizon at 6:48 pm (you will need to click on it to get a readable version), showing the tack of the ISS through the sky. Reader Chirs Wyatt from Ballarat sent in this great picture of Mecury and Spica from Saturday night (click on the image so you can see it in its full size glory). Canon PS S2 IS at 50 ASA & 2 seconds exposure. I'll put up my shots later. Did you folks see it, it looked great didn't it. 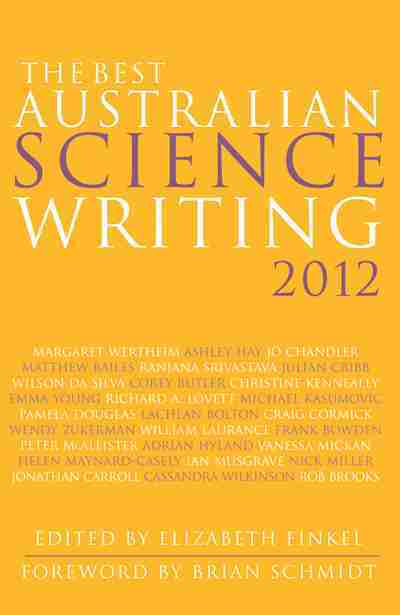 The 21st Carnival of Space is just been launched over at Henry Cate's blog. The theme of this weeks Carnival in the X-prize, now revamped with the Google Lunar Challenge. Many of the contributors mull over this in very entertaining and thoughtful posts. Other posts feature spacecraft in many ways, including our old favorite Pioneer. So grab a ticket and head on over the the surPrizing Carnival. The Carnival of Space will be held next week at wanderingspace, if you have seen some writing on space that you think would be good Carnival material, click here for information on submitting a post. If you look at the image of the western horizon to the left, you will notice the labels Spica and Mercury, but only one dot. That is because Mercury and Spica are so close, only those with superb vision will be able to see them see them separately, the rest of us will need binoculars. When will this rare sight happen? The evening of Saturday, September 22. The best time to look is between half an hour and an hour after sunset. 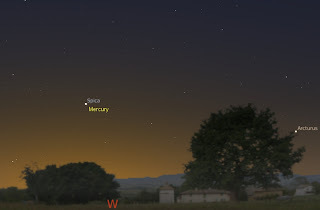 Mercury will be readily visible above the western horizon. Watching over the next few days as Mercury sidles up to Spica and then passes it will be nice too. Unfortunately, bad weather so far has kept me from seeing it. I found this picture in a series of images I took some time ago, when I was developing old film with lunar eclipse images on them. It's one of the best images of the Southern Cross region I ever took (click to enlarge, it's better in the originals too). The star images are steady, the Coal Sack is clearly visible and the detail around theta Carina and eta Carina is fine. When did I take it? Where did I take it? What exposures did I use? I have no idea, as I have lost my note book. My notebook was an A5 spiral book with black cover and heavy drawing paper and LOTS of pages. But still small enough to conveniently carry with me wherever I went. I got it when my beloved Bettdeckererschnappender weisle and the kids bought me the 4" scope for Christmas many years back. I put all my observations in it, telescope, binocular, unaided eye. I carefully drew the Moon's craters and the positions of Jupiter's Moons, I sketched Jupiter's cloud bands and Mars's dark markings. I recorded meteor showers and eclipses, sketched passing comets. When I set up the webcam and the SLR, I recorded dates, and times and locations ... and exposure conditions. I had a wealth of photography information in there that allowed me to set my shots up time and again. It would have been a great help with the last Lunar Eclipse. But last camping trip, the notebook went out with me under dark skies, but didn't come back. I miss all the photography data, but I also miss the history, nearly 10 years of observation were in that notebook. 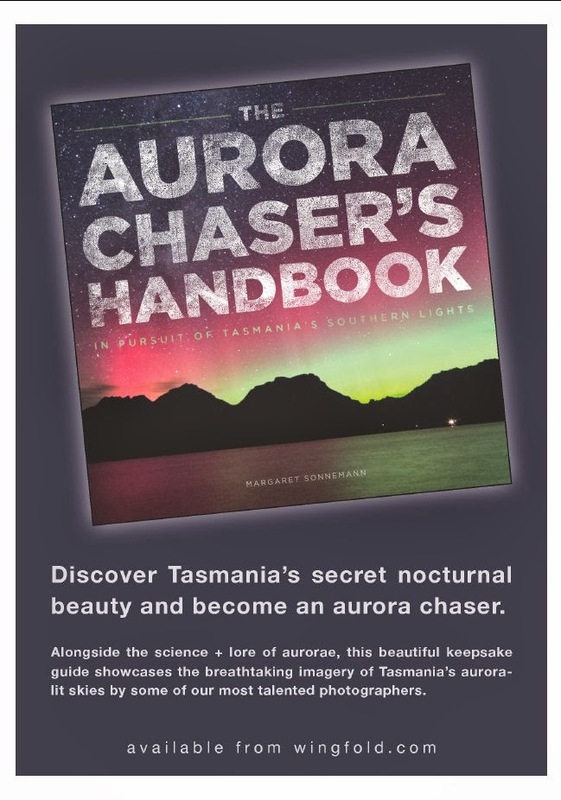 Flipping through the pages could bring back memories of great nights, the ages spent getting the faint details of comets right while the stars arced above, watching meteors scream across the sky while the horizon lightened and the sky filled with birdsong. I have a new notebook now, almost identical to the old one, but I don't have the memories it contained. 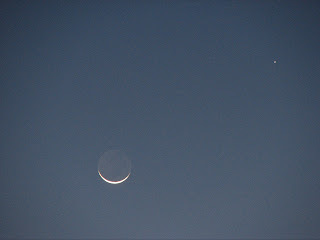 Reader Chris Wyatt from Bendigo sent in this wonderful picture of Mercury near the crescent Moon (comlete with Earthshine). Click on the image to enlarge it. It was taken last evening (Thursday 13 Spetmeber) at about 6:45 pm local time with his Canon S1IS at 200 ASA & 0.3 sec setting, at maximum magnification. Beautiful shot. Otherwise, you'll end up like me. Sick, sick, sick.Haven't been able to do anything usefull for days. Well, I got my photos of the Lunar Eclipse back. They were a little bit dissapointing. The vast majority were grossly over exposed. The projection setup I used for my 4" scope was a barlow lens in the T-adaptor, and this produced a much larger, diffuser image compared to the set-up for the 8" scope (25 mm lens in T-adaptor), so when I used the 4" scope timings I was used to, and everything came out much brighter. Bleah. Focus was also a surprising problem, as the imgaes looked pretty crisp in the focusser (but then, they were so over exposed who knows!). Still, I have a couple of nice pictures to complement the mobile phone images on the night. The 18th Carnival of Space is now up. Well, it was up a while ago, but as I've been sick with this flu, I didn't get around to notifying people. Anyway, it's up at Out of the Cradle and is a real bumper issue, with lots on spaceflight, things Lunar and planets galore. Pop over for a look.